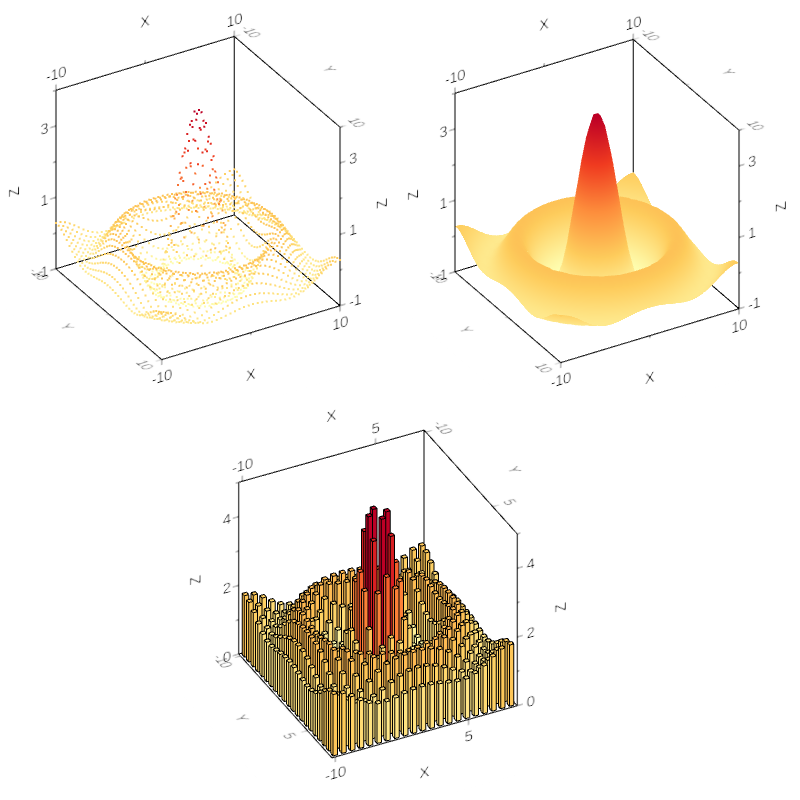 Returns a const pointer to the WCartesian3DChart on which the dataseries is drawn. Class representing grid-based data for on a 3D chart. General information can be found at WAbstractDataSeries3D. Icon::Information on how the model is structured is provided in the subclasses. GridData can be represented in three ways. This is indicated by Series3DType and can be either Series3DType::Point, Series3DType::Surface or Series3DType::Bar. Note that points and surfaces can only be added to charts of type ChartType::Scatter, while bars can only be added to charts of type ChartType::Category. When the data is shown as a surface, a mesh can be added to the surface. This draws lines over the surface at the positions of the x- and y-values. For bar-series data, it is possible to adjust the width of the bars in both directions. The three types of data-representation are illustrated below. Returns the bar-width in the X-axis direction. Returns the bar-width in the Y-axis direction. JSlot to change the value above which the data series will be clipped on the given axis. The JSlot takes one extra argument: the value to clip below. The jsRef() of this JSlot is only valid when this WAbstractGridData has been added to a WCartesian3DChart. If this WAbstractGridData moves to another WCartesian3DChart, the jsRef() of the JSlot changes. JSlot to change the value below which the data series will be clipped on the given axis. Gets the color of the clipping lines. Returns whether clipping lines are enabled. Gets the value above which the data series will be clipped on the given axis. Gets the value below which the data series will be clipped on the given axis. This function is called by updateGL() in the chart to which this dataseries was added. This function is called by initializeGL() in the chart to which this dataseries was added. Get the color map for the isolines. Get all of the isoline levels. Returns whether the surface-mesh is enabled for this dataseries. Returns the computed maximum value of this dataseries along the given axis. 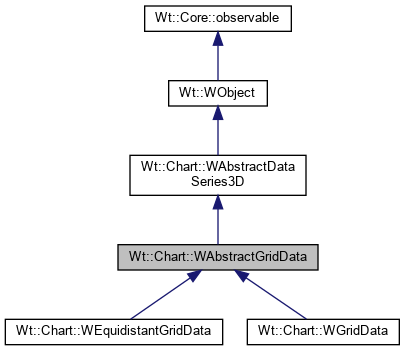 Implemented in Wt::Chart::WGridData, and Wt::Chart::WEquidistantGridData. Returns the computed minimum value of this dataseries along the given axis. Update the client-side painting function. This function is called by paintGL() in the chart to which this dataseries was added. Returns the pen that is used for drawing the mesh. Return the bar that is closest to the look point at the given pixel. A ray is cast from the given pixel's x,y position (from the top left of the chart, in screen coordinates), and the closest bar on this WAbstractGridData is returned, along with its distance from the look point. Note that if this WAbstractGridData is hidden, this method still returns the closest bar as if it was visible. Also, if multiple bars are on the same bar chart, the bar that is returned may be behind another data series. Use the distance field of the returned WBarSelection to determine which data series is in front from the given angle. If there is no bar at the given pixel, then a selection with an invalid WModelIndex is returned. The distance is then set to positive infinity. Find all points on the surface that are projected to the given pixel. A ray is cast from the given pixel's x,y position (from the top left of the chart, in screen coordinates) and every intersection with the surface is returned, along with its distance from the look point. Note that the coordinates of the intersection points are interpolated between the data points that make up the surface. This function is called by resizeGL() in the chart to which this dataseries was added. This option only takes effect when the type of this WGridData is Series3DType::Bar. The values provided should be between 0 and 1, where 1 lets the bars each take up 1/(nb of x/y-values) of the axis. The default bar-width is 0.5 in both directions. Sets the color of the clipping lines. Sets whether clipping lines should be drawn where a surface is clipped. Clipping lines are disabled by default. Note that rendering will be significantly slower when enabled. Set the value above which the data series will be clipped on the given axis. This only affects data series whose type is Series3DType::Surface. Set the value below which the data series will be clipped on the given axis. Set the color map for the isolines. When no color map is defined for the isolines, i.e. isoColorMap() is set to NULL, the color map of this WAbstractGridData will be used. The isolines are only drawn if the type is Series3DType::Surface. Isolines are drawn on the top or ground plane of the chart. Only applies if the type is Series3DType::Surface. The isoline levels are set in the coordinate system of the item model. Sets the WPen that is used for drawing the mesh. Used when drawing the mesh on a surface or the lines around bars. The default is a default constructed WPen (StandardColor::Black and one pixel wide). Note: only the width and color of this WPen are used. Enables or disables a mesh for when a surface is drawn. The default value is false. This option only takes effect when the type of this WGridData is Series3DType::Surface. The mesh is drawn at the position of the x-axis and y-axis values. Sets the type of representation that will be used for the data. All representations in Series3DType are possible for the data. Note that Series3DType::Point and Series3DType::Surface can only be used on a chart that is configured as a ChartType::Scatter and Series3DType::Bar can only be used on a chart that is configured to be a ChartType::Category. The default value is Series3DType::Point. Returns the type of representation that will be used for the data. This function is called by updateGL() in the chart to which this dataseries was added. Before this function is called, deleteAllGLResources() is called.